Keithley Instruments, Inc., a world leader in advanced electrical test instruments and systems, has introduced a variety of enhancements for its award-winning Model 4200-SCS Semiconductor Characterization System. The Keithley Test Environment Interactive (KTEI) V8.2 upgrade includes new non-volatile memory (NVM) test libraries and sample projects for a variety of emerging memory technologies. The upgrade also supports making very low frequency capacitance-voltage (C-V) measurements, which are useful for characterizing device technologies such as polymer electronics, organic LEDs (OLEDs), and OLED-based displays. In addition, KTEI V8.2 supports Model 4200-SCS system configurations with more ultra-fast current-voltage (I-V) test modules than any competitive solution, so users can test even more devices in parallel, increasing test throughput and reducing time to market. The new NVM test libraries included in KTEI V8.2 expand the system's capabilities for testing all types of non-volatile memory devices, including flash, phase change memory (PRAM and PC-RAM), resistive memory (RRAM or ReRAM), and magnetoresistive (MRAM) memory devices. KTEI V8.2 provides a common set of test libraries for testing the various NVM technologies while incorporating the unique measurement hardware requirements associated with each. The sample projects included for each type of NVM provide the flexibility that researchers need to set up and execute tests quickly, as well as to analyze data. The examples are designed to adapt easily to use with most emerging memory technologies. The test libraries are designed to build on the capabilities provided in two of the newest hardware options for the Model 4200-SCS, the Model 4225-PMU Ultra-Fast I V Module, and the Model 4225-RPM Remote Amplifier/Switch Module. Together, these new modules allow precise sourcing of high speed pulses, as well as accurate measurements of the transient signals produced during testing. The Model 4225-PMU measures voltage and current simultaneously at high speeds over a wide dynamic range. The Model 4225-RPM moves the measurement circuitry of the Model 4225-PMU module closer to the DUT to minimize the effects of stray capacitance while providing additional low current measurement ranges. The Model 4225-RPM also provides fast automatic switching between the 4225-PMU and the system's capacitance-voltage (C-V) and DC source-measure units, which helps simplify the test configuration and reduces the time required to complete test sequences. Semiconductor R&D typically requires a combination of quasistatic (ramp rate) and high frequency techniques for measuring the capacitance of device structures. However, when applied to devices with too much current flow or leakage, quasistatic C-V has some limitations; for example, parallel resistance cannot be extracted effectively and the results can be quite noisy. A variety of device technologies now require AC-based capacitance characterization at very low frequencies - much lower than the minimum frequency of multi-frequency C-V meters or LCRs. Measuring small capacitances at low frequencies translates to extremely high impedance values, which AC-based measurement instruments often cannot characterize accurately. KTEI V8.2 includes a new patent-pending technique for making very low frequency capacitance-voltage (VLF C-V) measurements with the system's DC SMUs and low current remote pre-amplifier that allows measuring device capacitance and resistance at frequencies from 10Hz down to 10mHz. This new technique complements the optional Model 4210-CVU capacitance meter's existing high frequency (1kHz to 10MHz) capabilities. The Model 4200-SCS system can now support up to six Model 4225-PMU modules in its nine-slot chassis. Each module provides two channels of voltage pulse sourcing (with pulse widths ranging from 60 nanoseconds to DC) and simultaneous current and voltage measurement at acquisition rates of up to 200 megasamples/second (MS/s), so it's now possible to configure a system with up to 12 simultaneous ultra-fast I-V channels. By boosting the maximum number of Model 4225-PMU modules the Model 4200-SCS can support, KTEI V8.2 expands the system's ability to characterize multiple devices quickly by testing them in parallel, which is increasingly important as new devices move from the R&D lab toward production. This higher level of parallel test can be applied to testing a device's ultra-fast bias temperature instability (NBTI), a transient failure mechanism that requires high speed measurements to characterize, as well as to other forms of device reliability testing and multi-DUT NVM testing. By supporting higher test throughput, KTEI V8.2 helps shorten time to market and offers more effective process control. Keithley's Model 4200-SCS semiconductor parameter analyzer replaces a variety of electrical test tools with a single, tightly integrated characterization solution that is ideal for a wide variety of semiconductor test applications including technology development, process development, and materials research in reliability labs, materials and device research labs and consortia, as well as any lab needing a benchtop DC or pulse instrument. Keithley has continually enhanced the Model 4200-SCS's hardware and software ever since its introduction. This commitment to ongoing system innovation ensures a cost-effective upgrade path, so users don't have to buy a new parametric analyzer because their old one is obsolete. Systems can be upgraded cost-effectively to keep up with the industry's evolving test needs, so capital investments in the Model 4200-SCS stretch much further than with competitive test solutions. All new Model 4200-SCS systems are equipped with KTEI V8.2 software. To obtain the software upgrade and discuss any additional system hardware needed to use the new software capabilities, current Model 4200-SCS owners should contact their Keithley representative for assistance. To learn more, visit http://www.keithley.com/data?asset=55952 or contact the company. With more than 60 years of measurement expertise, Keithley Instruments has become a world leader in advanced electrical test instruments and systems. Their customers are scientists and engineers in the worldwide electronics industry involved with advanced materials research, semiconductor device development and fabrication, and the production of end products such as portable wireless devices. The value Keithley provides them is a combination of products for their critical measurement needs and a rich understanding of their applications to improve the quality of their products and reduce their cost of test. 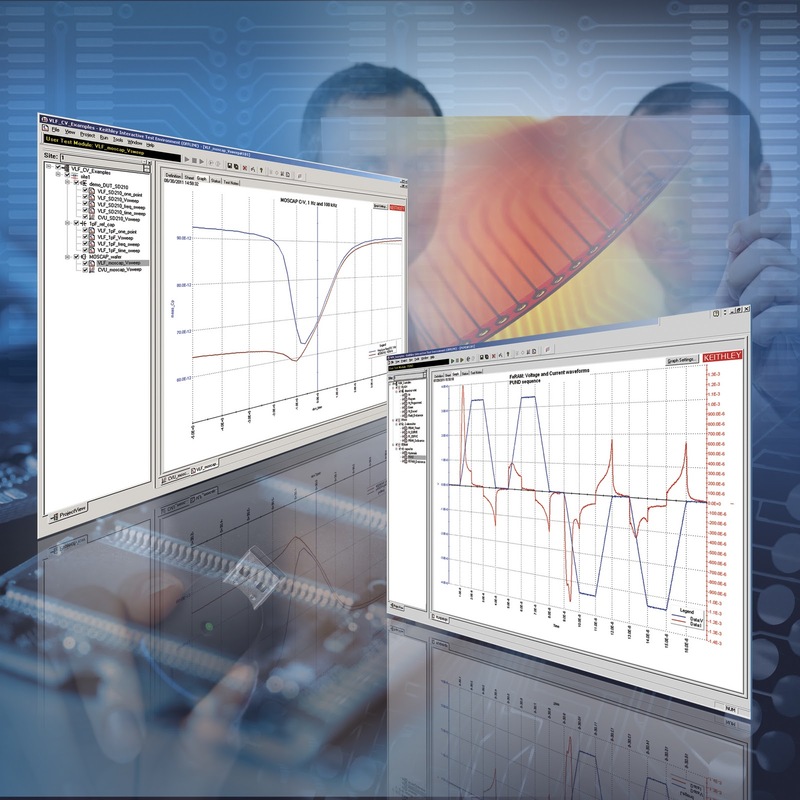 In 2010, Keithley Instruments joined Tektronix as part of its test and measurement portfolio.